I’m back to Carson. This time reading her Autobiography of Red, a hybrid work of poetry and prose, based on Greek mythology. Autobiography of Red is in part a reinterpretation of a lost Stesichorus poem called: “Tale of Geryon“. My knowledge of Greek antiquity is limited, I know a bit about sculpture and architecture, I have read Homer, a bit of Sophocles, Euripides and Aeschylus, some Aristophanes … but thats about it. 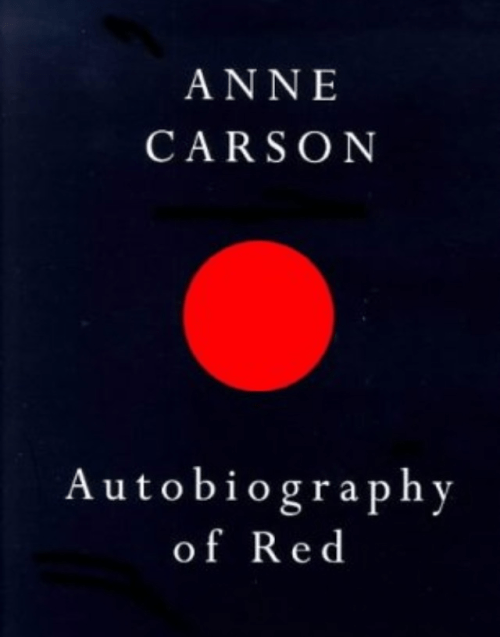 And it is, to be honest, really not Carson’s take on antiquity that triggers me, what impresses me most in this peculiar work of hers, is Carson’s way of weaving past and present into a continues contemporary whole. Anne Carson writes in a language any poet would kill for: sensuous and funny, poignant, musical and tender, brilliantly lighted.